I finished this quilt a couple months ago, but didn't want to post it until it was in the hands of it's new owner (my nephew). This was originally going to be a zigzag quilt, but at the last minute I cut up my 5 inch squares into 2.5 inch squares and sewed them all together. I think I really like it this way...a simple design. color inspiration came from here. I used heather ross buses again as the backing (I am quickly running out of this print, and it's my favorite...) it's been a long time since I've done an all squares quilt, and I forgot how much I like it! Not much sewing/quilting going on here, we welcomed our baby girl, Ginger Anne, three weeks ago today. She's our 3rd--I swear time has sped up, days go by and I feel like I haven't accomplished much, lol. We are starting to find some routine now, and looking forward to the holiday season (which will add to the craziness!). beautiful quilt, congrats on the baby girl! what a beautiful quilt. it's a great color combination. I love the orange accents!! A baby is a blessing - congrats!! so simple, yet so very cute! some times the simple desings are the best... your quilt is so beautiful! Congrats on having a baby girl, that is so wonderful. I love the little squares and the orange striped binding! The binding really pulls the orange in the squares - love it! Conrats on the baby girl! Congratulations on the arrival of your new baby! I hope it all goes well as you all settle down. Remember sleep is over-rated!! I love the quilt. I am such a fan of squares... I just can't help it, they look great. Congratulations on the new babe! Enjoy it as much as you can in the midst of the chaos. Oh, Nettie! Congrats on Ginger's arrival, love her name! 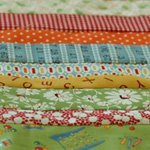 Loving the new quilt Netttie and I can't wait to start our new bee with you! so lovely!! love all the blue! congrats on your new arrival!! it is precious....absolutely adorable. i have a grandson and i am having the hardest time finding things that are not well...just plain stupid for boys. this is just perfect. i love, love, love the small squares. i have fallen into the munki munki obsession with the intention of improv for each and every grandchild. Simple...and simply beautiful. Love the striped binding. I love that quilt! yes, squares are wonderful! enjoy your new little one! a lot! congrats on the baby -- time DOES speed up with the third, pretty soon, she'll be in school! Congratulations on your new addition! Have fun snuggling that baby! Congratulations on the arrival of Ginger...what a beautiful name! And what a beautiful quilt. I love squares too. Well done! Every time I see squares all lined up I think of all the PINNING that had to be done :-) It looks perfect! 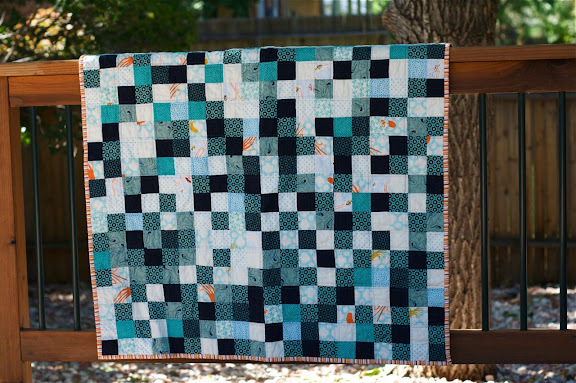 Love the colors of this quilt! That is such a sweet quilt. Congrats on the baby girl. Nothin' like a newborn. I'm amazed that you find time to make it to the computer. Wow, I really like the color combination of this quilt. Really nice. Welcome Baby Ginger! And congratulations. What a beautiful quilt. beautiful quilt, love the colors and blocks. that is beautiful....or maybe i should say handsome!! Love that quilt! What is the binding fabric? I absolutely love, love, love this quilt. All the blues and hints of orange are fabulous. Hurray for the sweet baby girl! Congrats on your sweet little girl. I love the buses fabric and need to buy a bolt of my favorite so I can use it over and over again too. Such a lovely quilt! The binding is just perfect on it. Thrilled for you that new baby Ginger is there to help you spend your free (??) time. I hope to see her picture soon. The little squares of so many fabrics made a great quilt. Love it. I love your quilt, very cute. Congratulations Nettie! Little girls are wonderful. The quilt is beautiful too! Congratulations on your wee girl. The quilt is beautiful. Perfect for a boy. Congrats on the new lil' baby!! So exciting. And the quilt is wonderful too! Firstly, congratulations on your new bub...hope all is going well. Secondly, looking forward to you joining the Bee Imaginative bee! And last...but by no means least - gorgeous quilt! Congratulations! Good luck with all the craziness - hopefully your #1 & #2 keep each other somewhat entertained. :) I know that's what saved me when #3 arrived. Hope you're able to squeeze in a nap here or there too! Love the quilt. Hooray for squares. Very nice quilt; lucky nephew and love colors. Congratulations on the new baby--Ginger is the cutest name ever! Lovely quilt - colours look brilliant together! I love, love this quilt. Congratulations on your daughter! Congrats, Dear! And I love the quilt! My, oh my! Completely beautiful! And what a beautiful quilt -- i'm loving the 2.5" squares! Congratulations on Ginger Anne! 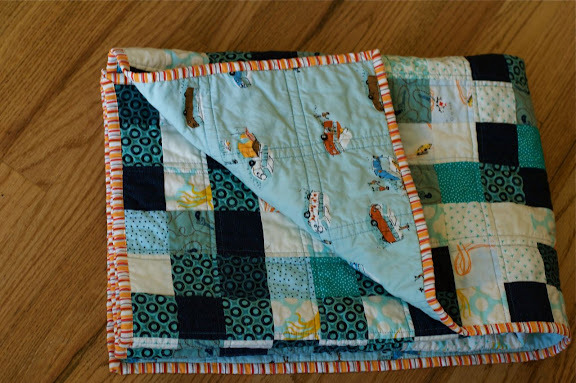 Wonderful baby boy quilt - lucky nephew! congrats on your new little one! i'm so excited to hear the great news. i've been wondering how you are doing. LOVE the tiny squares quilt. so sweet. I love your aqua square quilt. Even though squares are so simple, they really are wonderful when they all come together. Good job! Congratulations - and wow! did you plan that out or did the wonderful randomness just happen? many congratulations to you all! Love the quilt - it is perfect for a boy! so cute! there's something about simple squares with a random spattering of the colors... i love it! Very pretty and I like the way you quilted it! Congrats on the finish and I love the blues that you used! Welcome Ginger Anne! Thanks Nettie for your latest inspiration. Another simply stunning quilt. I love this quilt, so simple, great colour combo!! I have most of these fabrics.... I might do something very similar. Thanks for the inspiration! I love this quilt. It will suit a boys room. What I love about it is the little bits of orange here and there. Congratulations on your little girl! I was wandering what it was going to be. Hope everything will stay fine. Enjoy her! 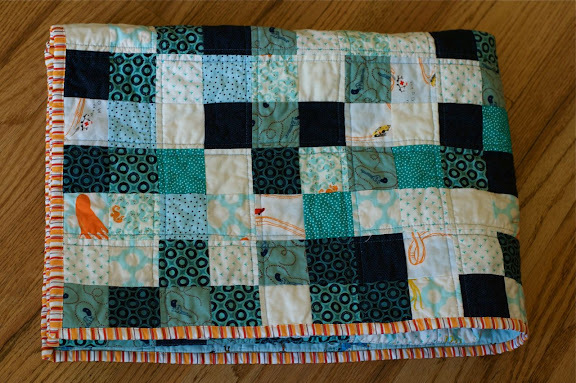 Congrats on your new addition and the quilt is beautiful! Love the colors and the squares. Love your quilt! How do you keep the squares so straight? Whenever I do something like this it will turn out lopsided? Any secrets? So nice to hear from you. Congratulations on your baby girl....great excuse for pink, red, yellow.....! Congratulations on your baby girl! I had my third, also a girl, in June. I feel the same way. The days speed by in a blur. love the simplicity of this and your color choices. those dishes were a great inspiration! hope you are enjoying every minute with the new little one. Beautiful quilt and congratulations on the newest little doll. I like the simplicity of an all-squares quilt, too! The colors are great, as are your inspiration dishes. I'm in the new quilting bee with you (my first time), so I'm checking out each person's blog. Congratulations on the new baby! Lovely quilt! The colors are gorgeous!! 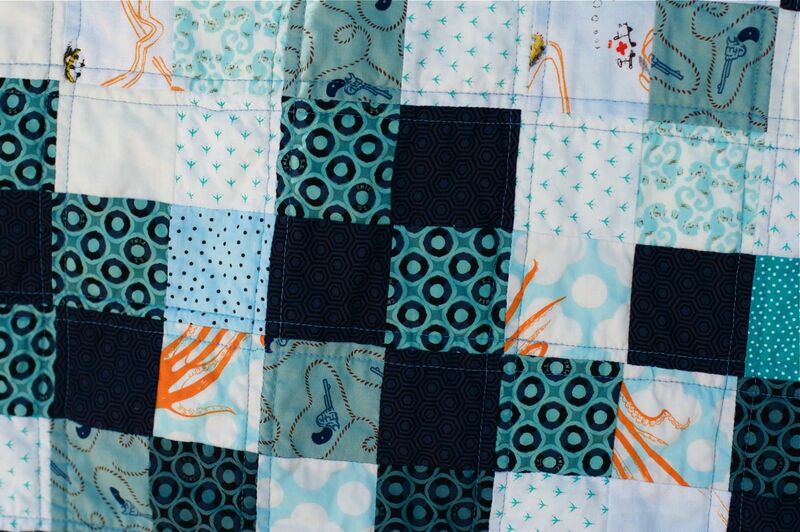 Wow, this is one gorgeous and fun quilt! I love squares and straight lines too. Happy New Year!